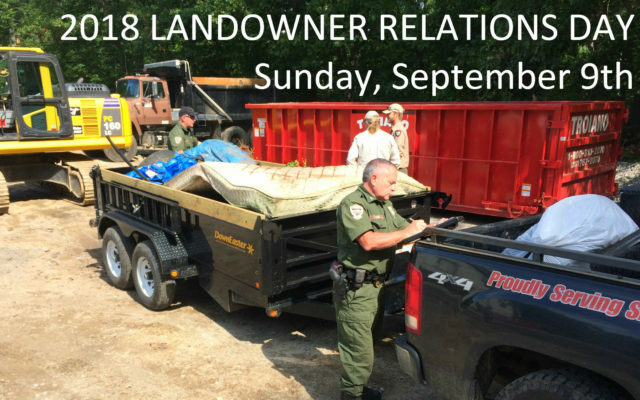 The Maine Department of Inland Fisheries and Wildlife and the Maine Forest Service will host a statewide cleanup event Sunday, Sept. 9, 2018. AUGUSTA, Maine — The Maine Department of Inland Fisheries and Wildlife and the Maine Forest Service will host a statewide cleanup event Sunday, Sept. 9, 2018. The event, said DIFW officials, allows organizations to show their appreciation to the private landowners of Maine who allow the use of their property. Clubs or organizations can enter by calling 287-5240 to speak with Virginia Vincent, or e-mail her at Virginia.Vincent@maine.gov. Please provide the following info: club /organization name and number participating; area of the state where the group is willing to help; a contact person and phone number and/or e-mail address; and cleanup sites the group will work on, such as towns, locations, landowners, etc. The Maine Warden Service and Maine Forest Service staff will have sites available via e-mail, as well. Prizes will be offered for first through fourth place. For contest purposes, all loads of trash will be measured by pickup truck load at one of the designated drop-off spots by Warden Service or Forest Service personnel.